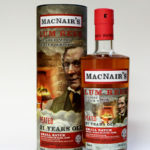 This entry was posted in Uncategorized and tagged Adelphi, Benrinnes, Bowmore, bunnahabhain, Douglas Laing, Duncan Taylor, Glen Grant, Glenallachie, Glenfarclas, Mackillops, Old Malt Cask, Speyside, Spirit of Speyside, Wemyss on 4 May 2010 by Mike. Third Place: Douglas Laing Big Peat. The winner of the competition for the best tasting note was by Ed Velthuizew from Holland. His prize was a bottle of his favourite whisky from the challenge which was the Adelphi Bunnahabhain.